I have been very absent from here of late. I have to say, it has been quite hectic this last month. Due to work, I was away from school for two weeks and away from my family for one of those. Although the two weeks away were hard work, it’s the return to full-time work after that absence that’s hectic. Full ON. Add to that the cold I collected at the end (and four days with absolutely no voice – yes, my family was happy! Hahaha! ), meant that after working all day, doing the after-school routine, either cooking dinner or cleaning up…or both, bedtime for the girls (you all know my pain) – I just wanted to slump into a chair and was only able to interact on Facebook. For now, everything else has dropped off a bit including my newish relationship with Twitter…and this blog. A much deeper and sadder one. Australia just elected in a new government two days ago and I’m deeply, deeply disappointed by the result. We all ‘knew it was coming’ (a phrase that was bounced around SO much, it passive-agressively directing the gaze of the masses), as we were inundated with biased reporting during the excruciating period of the pre-election campaign. In my heart I think the wrong government won. I was very saddened to hear that 4.5 billion dollars will be cut from Foreign Aid. It makes my heart heavy. All I want is a better world for everyone who’s on it because, quite frankly, who am I to get more than any other person on this planet? Who is Rupert Murdoch to get more? 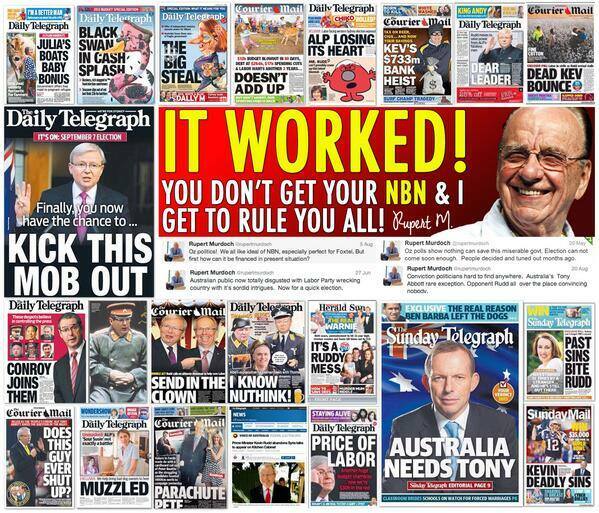 Why did Australia vote for one of the richest men on the planet to influence these elections (see above image), have his way with the NBN – AND get richer from it? What has he ever done for us? Foxtel? You pay him for that too. Isn’t he lucky that Australia was so compliant? I think everyone who voted Liberal, should all get a cash handout for it, don’t you think? A special thanks from Rupert. He can afford it. He won’t though. He’ll keep it in his pocket as will the new government, whilst others languish in starvation, are immersed in violence and have no. way. out. They do actually – Australia. Umm…actually no. Not welcome here. At all. In fact we’ll pay the people smugglers money for their boats. Yes, Australia voted for THAT. There are so many more issues, but I simply can’t. BUT – it’s a democracy and here we are. 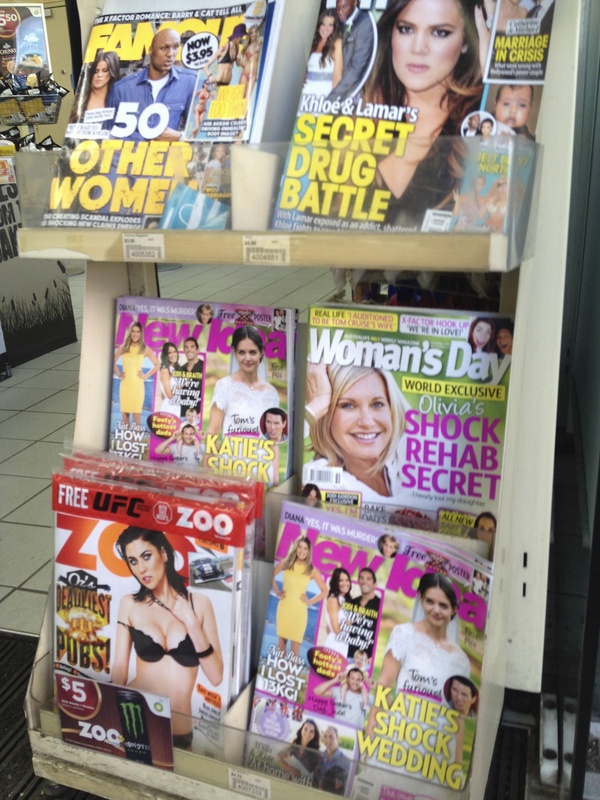 Together with a group of extraordinary activist women, mainly from Collective Shout – I am helping organise the campaign I mentioned a little while back; taking on the need to get rid of misogynistic magazines like ZOO, off the shelves of ‘family friendly’ locations like the Newsagency, Coles, etc. 3. that kids of too young an age are being exploited, with the hyper-sexalised, objectified and misogynistic images and DISCUSSIONS of women. Here’s a shot I took at a petrol station. Oh, so that’s where they’re positioning it now. Always at pram height too. Question #181: Does this worry you? I’m starting to feel that with the majority of this country, the answer is ‘No’. Maybe it’s because they see the logic of having a woman whose underwear is falling off her, seductively showing how ‘hot’ she is – burning for it – placed at the entrance, because it makes more money. Maybe it just doesn’t matter to them that it’s someone else’s 11 year old son buying it. I know there are people out there – many good people I’ve met through this blog – who will be standing with us. But we’ll be the minority. This election just handed me that most disappointing and depressing lesson. But – I’m here – I’m not going anywhere – I have about 2 million more things to say and DO (one of them being this upcoming campaign) – so please, stay tuned.